DataNumen Database Recovery (DDBR) is a powerful database recovery suite. 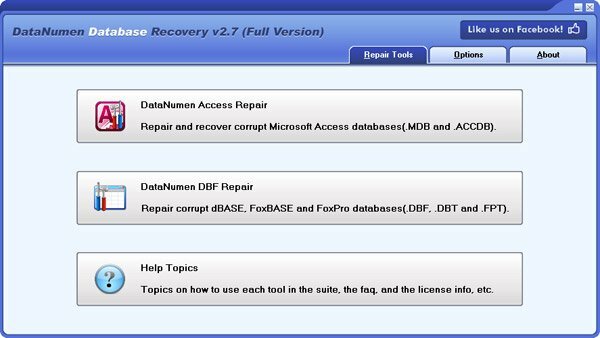 It includes recovery tools DataNumen Access Repair (DACCR) and DataNumen DBF Repair (DDBFR). DACCR can repair corrupt Access databases. MS Access 95 to 2016 and Access for Office 365 are supported. DDBFR can recover corrupt DBF files. All versions of DBF databases, including dBASE, FoxBase, FoxPro, Visual FoxPro are supported. Export Table to SQL for MS Access databases helps the user to save table's data as a set of INSERT SQL statements. Predefined or custom separators like ';' and a few export options make tool flexible. The program has easy to use wizard interface.